Many years ago, in the gleaming, gem-filled depths of Neopia's mines, a hardworking Tonu miner named Helfin discovered a cave filled with rare and valuable jewels. A rather generous fellow, he decided he would distribute his riches among various Neopian charities, keeping only a pittance for himself and his beloved Sandan, Solly. For months Helfin worked tirelessly (always with the loyal Solly by his side) to extract every last gem. When the time came for Helfin to transport the treasures he'd unearthed, however, another miner (a rather wicked Bori who'd gotten wind of the Tonu's discovery) intentionally caused a cave-in that buried Helfin and his Petpet under tons of rubble. After hours of being trapped, Solly somehow managed to escape, immediately rushing to find help for his owner. As he scampered toward the mine's exit, Solly clearly saw the Bori, who was hurriedly filling a minecart with the gems that were rightfully Helfin's. By the time Solly returned with help, it was too late: his owner had perished, and the Bori Miner was long gone. Not satisfied with living off the wealth from his ill-gotten riches, the Bori Miner used his fortune to set up one of the largest mining operations in all Neopia. 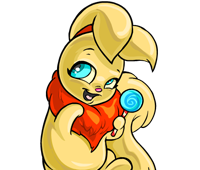 Ever since the Bori went into business, however, Solly has been taking as many gems from him as possible and, carrying on his owner's legacy, turning over the profits from his thievery to those that care for Neopia's neediest citizens. You are about to send feedback on Jumpin' Gem Heist. We would appreciate it if you could give the game a rating out of 10, and also tell us any additional comments you may have. Thank you for your feedback on Jumpin' Gem Heist.